Art history has enriched the study of material culture as a scholarly field. This interdisciplinary volume enhances this literature through the contributors' engagement with gender as the conceptual locus of analysis in terms of femininity, masculinity, and the spaces in between. Collectively, these essays by art historians and museum professionals argue for a more complex understanding of the relationship between objects and subjects in gendered terms. The objects under consideration range from the quotidian to the exotic, including beds, guns, fans, needle paintings, prints, drawings, mantillas, almanacs, reticules, silver punch bowls, and collage. These material goods may have been intended to enforce and affirm gendered norms, however as the essays demonstrate, their use by subjects frequently put normative formations of gender into question, revealing the impossibility of permanently fixing gender in relation to material goods, concepts, or bodies. This book will appeal to art historians, museum professionals, women's and gender studies specialists, students, and all those interested in the history of objects in everyday life. 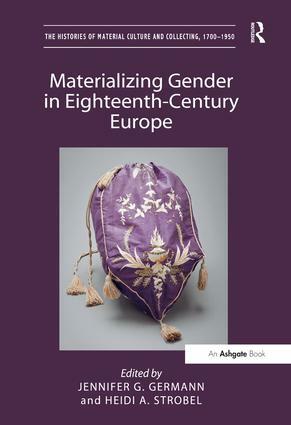 "Materializing Gender in Eighteenth-Century Europe is a great resource for specialists in eighteenth-century European art and culture as well as those whose methodological interest in material culture studies and gender will bring them to a new focus on the eighteenth century. This fine volume of essays offers thoughtful interpretations of how gender - both masculinity and femininity - is made manifest in material goods and their representations, consistently pointing out the role of these is not only in reflecting, but also constructing the gendered self." "This edited volume of essays is especially welcome for its shared emphasis on men and women under the rubric of gender. It incorporates a dazzling selection of objects from across eighteenth-century Europe that includes guns, fans, silver, embroidery and furniture. With many contributions from early career scholars, the status of material culture in art historical study has never looked more buoyant." "This collection presents a variety of perspectives on how and why objects shaped different gender codes, constraints, and even opportunities. (…) the vivid examples developed here — especially those by Freund, Lindeman, Williams, and Strobel — invite us to think rigorously about the kinds of objects assembled under the broad umbrella of material culture studies and how their surfaces and substances continue to open up the past. Germann and Strobel’s collection manages to advance the field and should appeal to its primary audience of art historians, but also more generally to those drawn to social history, travel, and the mercurial world of things." Jennifer G. Germann is Assistant Professor of Art History, Ithaca College, USA. Heidi A. Strobel is Associate Professor of Art History, University of Evansville, USA. The Histories of Material Culture and Collecting provides a forum for the broad study of object acquisition and collecting practices in their global dimensions from 1700 to 1950. The series seeks to illuminate the intersections between material culture studies, art history, and the history of collecting. It takes as its starting point the idea that objects both contributed to the formation of knowledge in the past and likewise contribute to our understanding of the past today. The human relationship to objects has proven a rich field of scholarly inquiry, with much recent scholarship either anthropological or sociological rather than art historical in perspective. Underpinning this series is the idea that the physical nature of objects contributes substantially to their social meanings, and therefore that the visual, tactile, and sensual dimensions of objects are critical to their interpretation. This series therefore seeks to bridge anthropology and art history, sociology and aesthetics. It encompasses the following areas of concern: 1. Material culture in its broadest dimension, including the high arts of painting and sculpture, the decorative arts (furniture, ceramics, metalwork, etc. ), and everyday objects of all kinds. 2. Collecting practices, be they institutionalized activities associated with museums, governmental authorities, and religious entities, or collecting done by individuals and social groups. 3. The role of objects in defining self, community, and difference in an increasingly international and globalized world, with cross-cultural exchange and travel the central modes of object transfer. 4. Objects as constitutive of historical narratives, be they devised by historical figures seeking to understand their past or in the form of modern scholarly narratives. The series publishes interdisciplinary and comparative research on objects that addresses one or more of these perspectives and includes monographs, thematic studies, and edited volumes of essays.